Kitchen war: Canada vs USA! 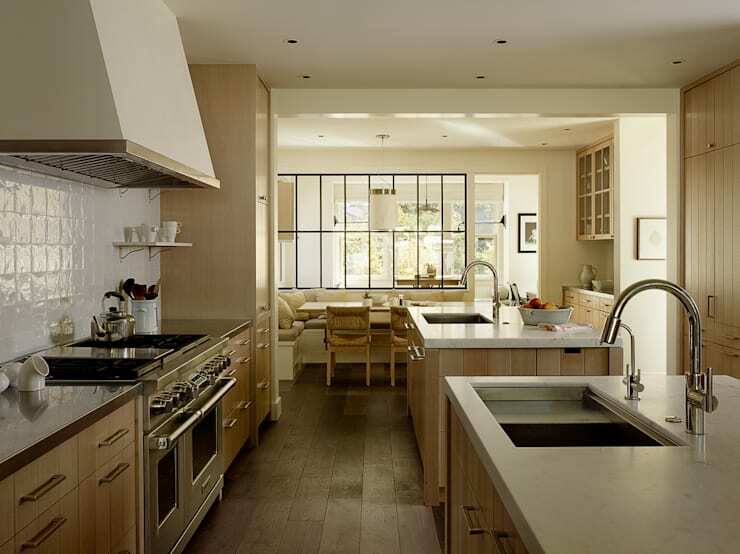 The rivalry between Canada and the USA has been rife for years, in a hockey and sports sense at least, but we're adding a new issue into the mix… KITCHEN DESIGN. Dammit guys, the stakes are high, as both countries have a wealth of amazing kitchen planners in place, all creating stunning spaces that we'd love to own, but the question is, who is doing it best? 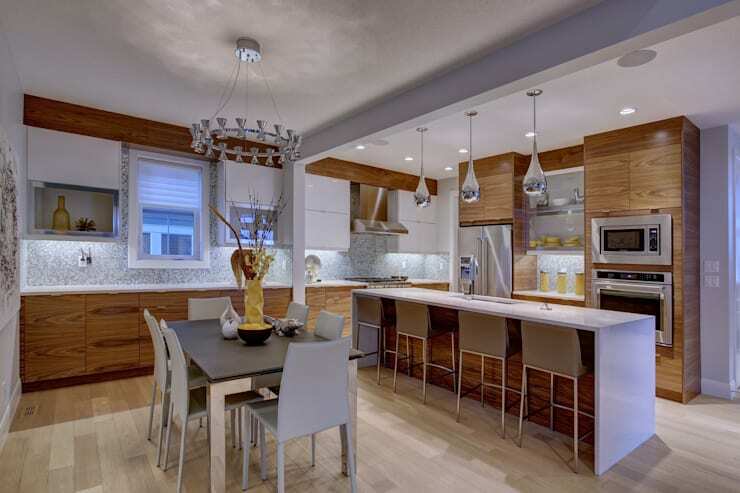 Let's be honest; we all know that the Canucks would kick the Bruins' asses, but when it comes to cool kitchen design, the result is a little less clear, so come and take a look at some beautiful spaces from Canada and the USA and see which you prefer! What's not to love here? Natural wood, white and stainless steel make for a stunning aesthetic and that huge island that doubles as a breakfast bar is divine! Shabby chic gray wood is everything! 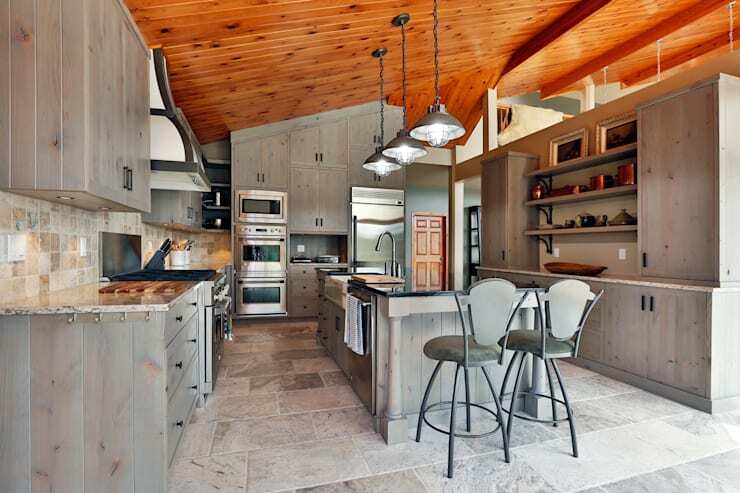 This large kitchen manages to look rustic, contemporary, cool and cozy all at once, which is an incredible feat! Go Canada! Can you see that amazing view? That's all Canada baby! We love the natural wood that seems to stretch out to the exterior, not to mention the combination of cabinet colors that create such an interesting contrast, as well as a huge amount of storage! This kitchen could honestly be straight out of a five-star hotel! The beautiful wood cladding and polished accessories are just a match made in heaven and have created this exemplar space that looks so high-end! We really love the color scheme here as it's classic and timeless, while also warm! Erm… can you see this turquoise? WOW! 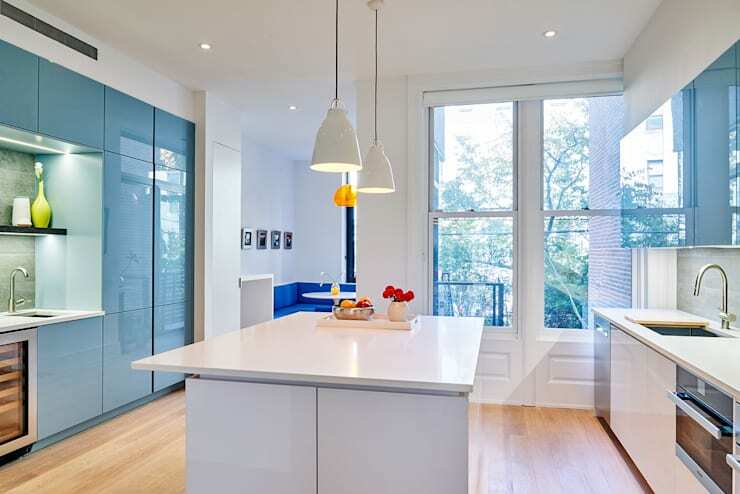 It's so bold to choose a vivid color for the range and fridge, while sticking to bright white cabinets. The proportions of this room are staggering as well and really help to amplify the impact of such a daring hue. Right! Now we've enjoyed some Canadian design genius, let's see what the USA has to offer in return! Well the USA are starting off strong here! An integrated dining room and kitchen, with a separate mini drinks fridge, looks amazing and has a very functional element to it. 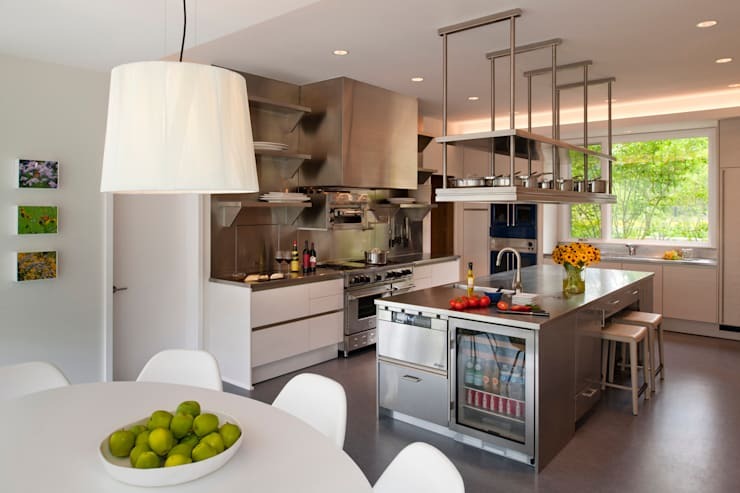 We are seriously lusting after that stainless steel island! How about a colonial take on a traditional kitchen? 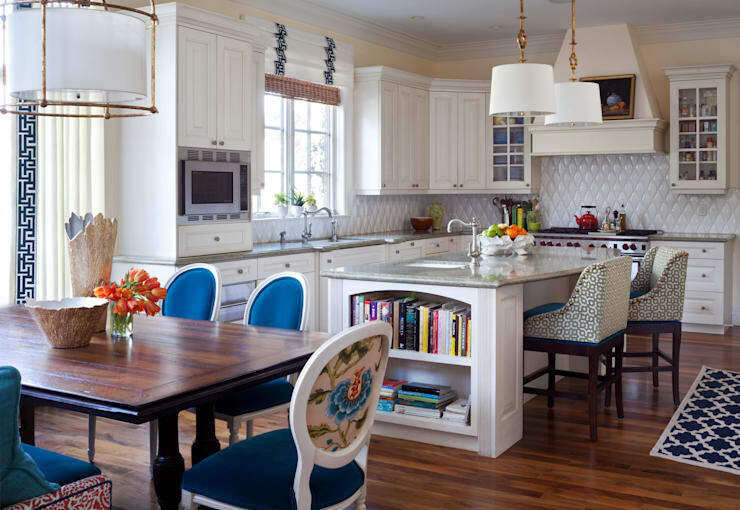 A white Shaker style kitchen looks incredible with some chintzy tiles and vibrantly upholstered dining chairs and has created such an engaging and family-friendly space. Looking for something cozy and chic for your kitchen design? Look no further than this USA masterpiece! Chunky worktops, wooden cabinets and sleek stainless appliances all just work perfectly together and make the most of the warm sunlight that pours in! 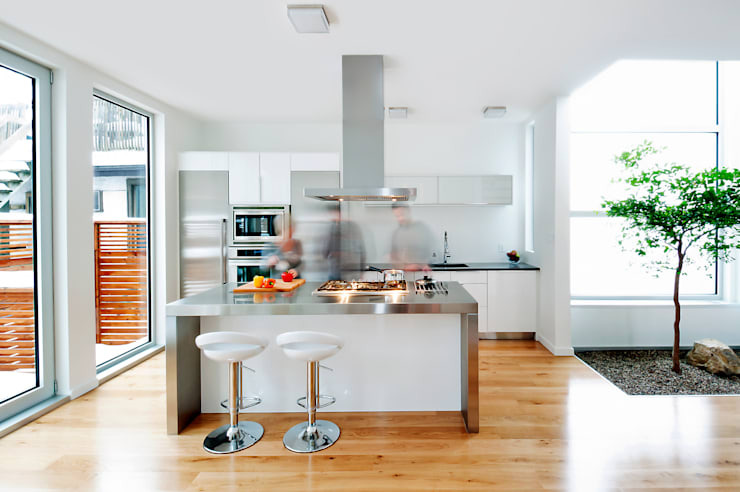 You probably know already that we love a little stark modernity and this kitchen is an amazing example of exactly that! 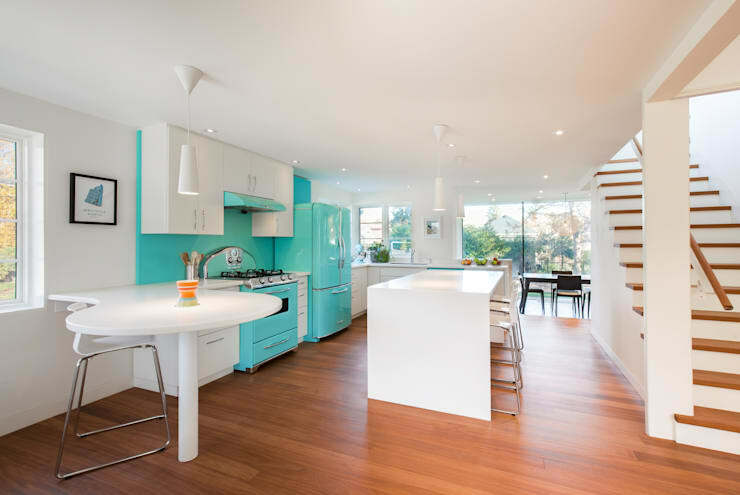 The bright white walls and vivid cabinets look incredible and just look at all that light that is reflecting around the room! It looks so spacious. Those pendulum lights too! Yum! USA is a-ok if this kitchen is anything to go by! 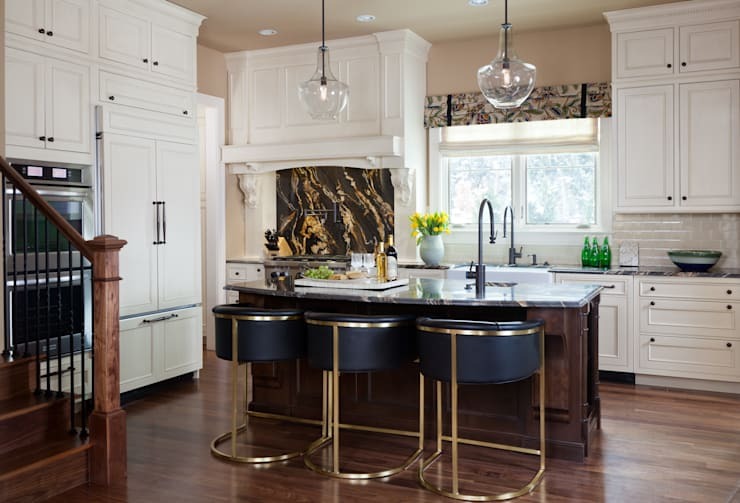 Traditional cabinets, rich colors and luxurious gold and marble accents are just spectacular! What an opulent and grown up space! 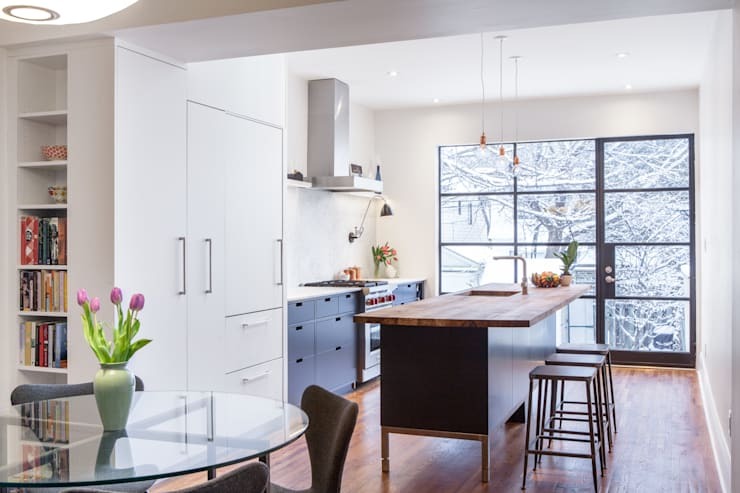 For even more amazing kitchen inspiration, take a look at this Ideabook: Kitchen renos: Where to splurge and where to save. So here's the question...which country wins for you?